Skateboard shoes designed by Aeon Footwear deliver to skateboarders the functions they expect. 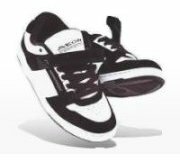 Creation of skateboard shoes that match to every skateboarder expectations is the motivation of Aeon Footwear research and development. The Playground Shoes with theirs Velcro strap and AE-Gel system sole provide the ultimate comfort and protection to skateboarder feet. This shoe is made for the city playground. Shoe's last: AE#04 - very thin with a round toe area; more control and precision. Shoe's sole: Cupsole type with AE-GEL® System flex & ground contact with cushion. Shoe's upper Features: Triple stitched reinforcing toe area. Rubber underlay on the ollie area. Lacing with velcro for ultimate ankle support. Hidden lace saving system. Elastic tongue straps absorbing insole. Shoe's sole Features: 400 NBS rubber outsole. Inserted EVA midsole with AE-GEL® heel cushion system. Dual density EVA footbed.